I.D. of Bellow - Upto 1000 mm. Working Temperature - Upto 150 Degree C max. Working Pressure - Upto 45 Kg. / cm2 max. 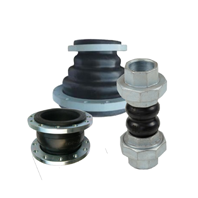 Rubber types - Neoprene, Elastomer, Natural, Silicon, Hypalon, Nitrile etc. Flange materials - Different grades of M.S. & S.S.
(Tie Rod, Nut & Lock Nut, Stretcher Plate), Revolving Flange / Loose Flange, Gaskets, Fasteners etc.